QUESTION: WHAT HAPPENS WHEN MY TENANT IS RESIDING IN AN ILLEGAL RENTAL UNIT THAT I HAVE TO EVICT? The purpose of Unlawful Detainer proceedings is the timely restoration of possession of the rental property to the rightful owner – the landlord. Time periods for pleading in Unlawful Detainer actions are a summary procedure that are shorter than ordinary civil cases. The eviction case is set for trial more quickly and entitled to priority on the trial calendar, and expeditious enforcement procedures are available. For this reason, issues beyond the possessory right are generally excluded from Unlawful Detainer actions, even though they may otherwise arise out of the subject matter of the action. This is because it would obviously be unfair to require the defendant-tenant to defend against ordinary California civil actions under the constraints of the summary procedure in eviction actions. Indeed, the constitutionality of these summary procedures is based on their limitation to the single issue of right to possession. In addition to, but of secondary importance, the landlord may also recover a monetary judgment for the amount of any rent owed with interest. (Code of Civil Procedure Section 1174(a) & (b); Due to the summary nature of an Unlawful Detainer proceeding and the shorter time periods involved to get to trial, the issues to be litigated in this type of action are very narrow. Thus, the only issues that are able to be investigated and decided judicially in an eviction action are those that go directly to the right of the landlord to recover possession of the property. Code of Civil Procedure Section 1161 is the statutory basis for an Unlawful Detainer case in California is based on a Three Day Notice to Pay Rent or Quit. In order to prove a cause of action for eviction for non-payment of rent the Plaintiff must prove (1) the existence of a rental agreement:, including the amount of rent to be paid per month; (2) the breach of the rental agreement by non-payment of rent; (3) lawfully serving the tenant with a Notice to Pay Rent or Quit that states (a) the amount owed, which may not exceed one year of unpaid rent, (b) the name, address and days of the week where the rent payment may be made, and (c) the person to whom the rent payment can be made; (4) the expiration of the Notice; and (5) Defendant(s) wrongful remained in possession of the rental unit after the expiration of the notice. So what happens where a landlord serves a 3-Day Notice to Pay Rent or Quit for the tenant’s failure to pay rent on an illegal rental unit in California? In 1978 Division 4 of the Second District Court of Appeal in California issued its decision in Gruzen vs. Henry (1978) 84 Cal. App. 3rd 515 which addressed the very issue raised in this case in the context of the landlord not possessing a certificate of occupancy required by the city and the illegal collection of rent. In Gruzen, the court of appeal reversed the money judgment entered in the Unlawful Detainer action but affirmed the judgment for possession. Essentially, the appellate court held the landlord’s failure to secure the certificate of occupancy required by the city ordinance before entering into a rental agreement provided a defense for the tenants in the Unlawful Detainer action brought by the landlord regarding the collection of unpaid rent. The landlord was entitled to an order of eviction – but not to an award of rent. 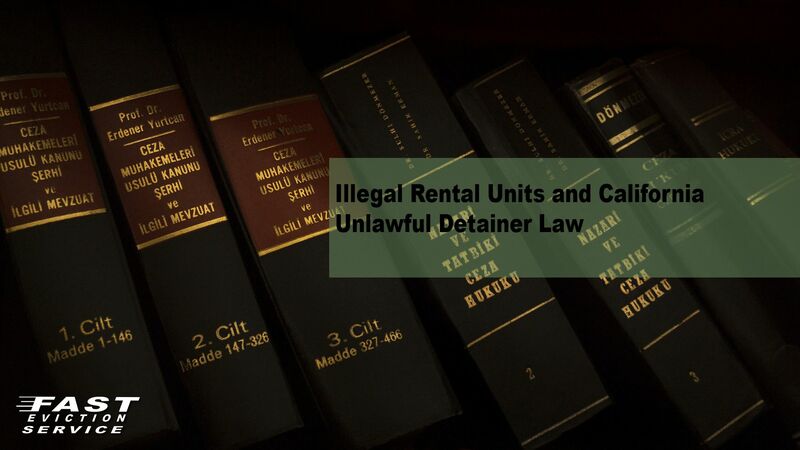 Thus, tenants may not remain in possession of “illegal” units without compensating the landlord. The Gruzen vs. Henry doctrine reaffirms the concept that no tenant can live for free and establishes the rule that a landlord can obtain a judgment for possession but not monetary damages against a tenant who is residing in an illegal rental unit but not paying rent. However, the landlord by renting an illegal rental unit and collecting rent on that illegal rental unit in California can be exposed to a very significant separate civil lawsuit filed by the tenant forcing the landlord to disgorge any rental payments received by the tenant, relocation expenses if the unit is governed by LARSO and possible punitive damages.